It’s New Year’s Resolution time, when we reflect on our past and resolve to do better this year. But, how do we set resolutions that we can actually achieve? How do you stick with these goals? Here are a few tips to help you stay on track for a successful 2016! First, be realistic with your goals. You didn’t gain that extra 20 pounds overnight, so don’t expect to lose it overnight either. Weight gain and loss occurs over time and is a result of total lifestyle choices, not choices made in one day or one week. 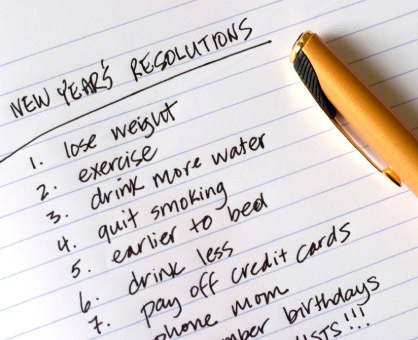 When making your new year’s resolution, start by setting SMART goals. When a goal is specific and measurable it is more likely to be achieved. For example, instead of the goal of “working out more,” set the goal of hitting the gym three mornings a week. Specific, measurable goals help you hold yourself accountable. They allow you to measure your success as the year progresses. Celebrate small victories! If you meet your goals, small or large, celebrate them! Celebrate them, however, by finding alternatives to food as your reward. By removing food for your reward system you are reinforcing the fact that food is intended to fuel your body, not be an outlet for emotions. Maybe it means splurging on a weekend getaway, activity, purchasing a new outfit or a trip to the day spa. Focus on the positives. It is easy to compare yourself to others. Remember, each of us is on our own wellness journey. Where you may have started today, the person next to you may have started months ago. Take time to love yourself and stop comparing yourself to others. Comparison is the thief of joy. When you stop comparing yourself to others you will have more time and energy to devote to your own journey and will feel far better about yourself. Don’t beat yourself up. This is a journey, not a final destination. When you slip up, don’t beat yourself up. It’s okay to have a piece of cake at a birthday party; however, the key is to make smarter choices most often. If you fall off the wagon today, pick yourself up tomorrow and start again. Ask for help. Lean on those closest to you for support. Find a friend with similar resolutions that can help you stay accountable. Voice your goals out loud as this helps to keep you on track. Don’t forget about the nutrition support available through your Martin’s Eat Smart. Be Well program. 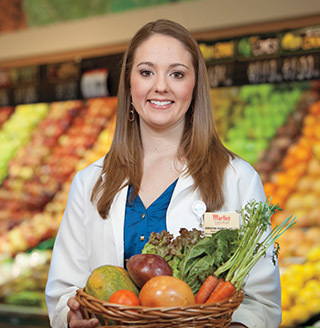 Attend a free monthly grocery store tour or sign up for an individual or family wellness consultation by calling (574) 239-1858. And last, believe in yourself and your ability to be successful. Whether you believe you can or you can’t, you’re right. Wishing you a happy and healthy start to 2016!